One of the challenges of small camping is adequate storage space. I KNOW that we travel with too much stuff, but we are often traveling thru a couple of seasons, so we do require more things than if we were just going out for a week or two. While tinkering in the Fireball one day, John found untapped storage space. If you have a T@DA, the cupboard below your refrigerator probably looks like this. 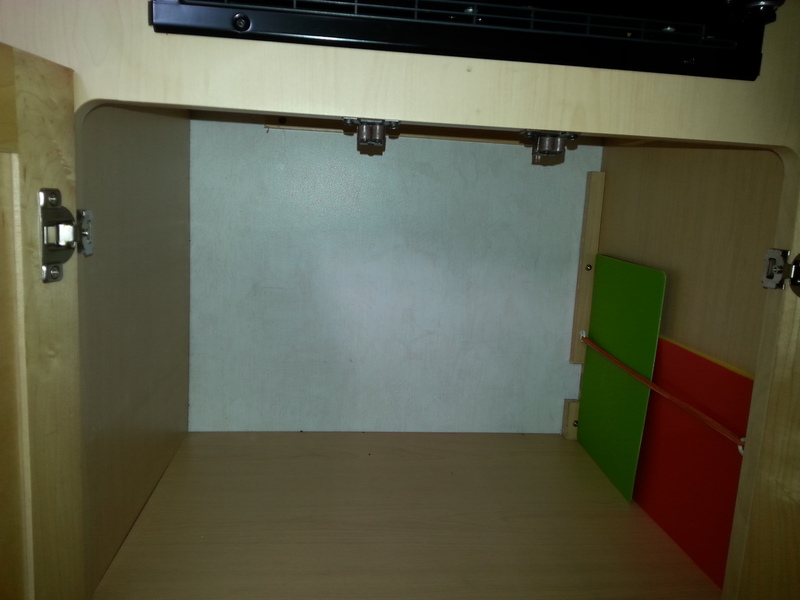 Did you know that below the bottom shelf is an empty space? 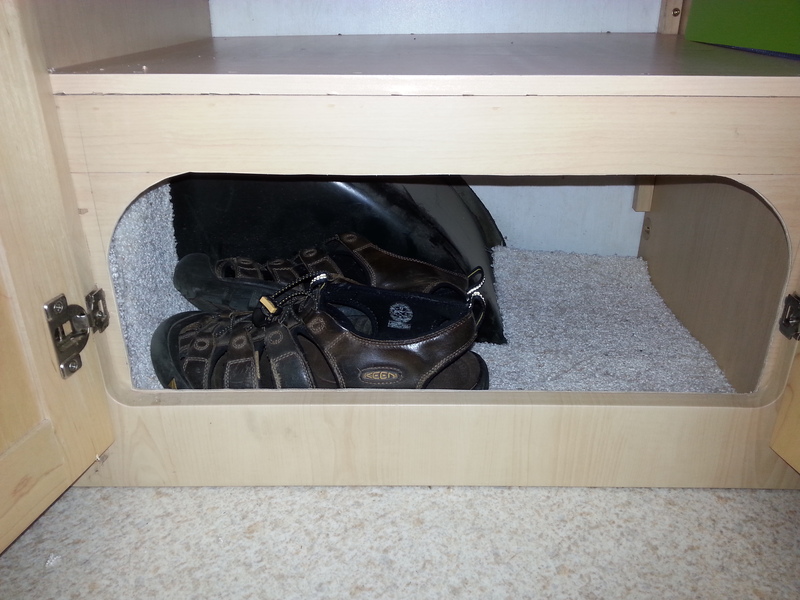 To John, it looked like the ideal spot for storage for our hiking boots, which usually reside in the back of the truck. So, he removed the lower panel, cut an arched opening, sanded a bit, reinstalled, and put a small piece of carpet on the floor to insulate a bit, and also to catch any moisture that may accumulate. Voila! Perfect for a couple of pairs of boots or whatever. Also, I love the half-sized flexible cutting boards that are available. These are non-skid, and washable. They come in four-packs. Bought mine at Bed, Bath & Beyond. With a small bungee and a couple of eye hooks, they are always handy, yet out of the way. We slide two boxes (a beer carton and a wine box) into this cupboard where they fit snugly and hold all of our foodstuffs. 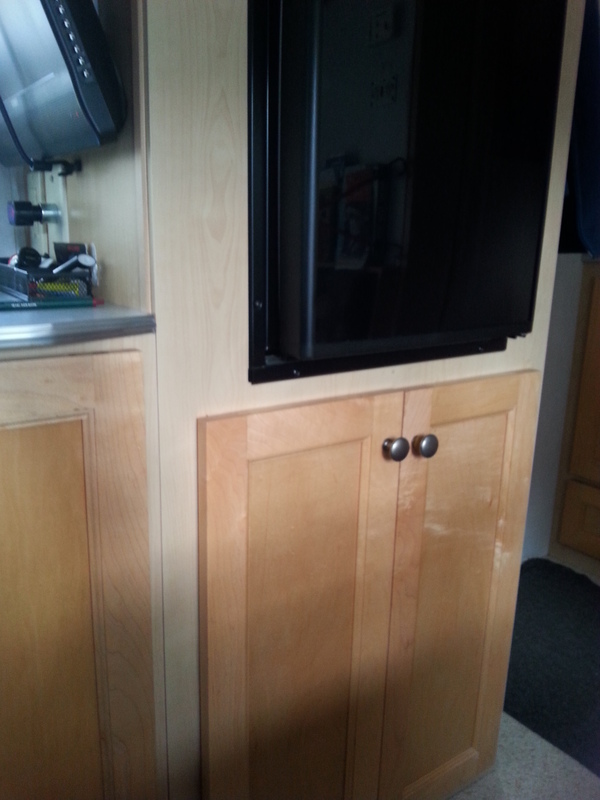 This entry was posted in camping, retirement, RV life, simple camping, T@DA, trailer modifications and tagged camping, RV life, simple camping by Judy Crankshaw. Bookmark the permalink. 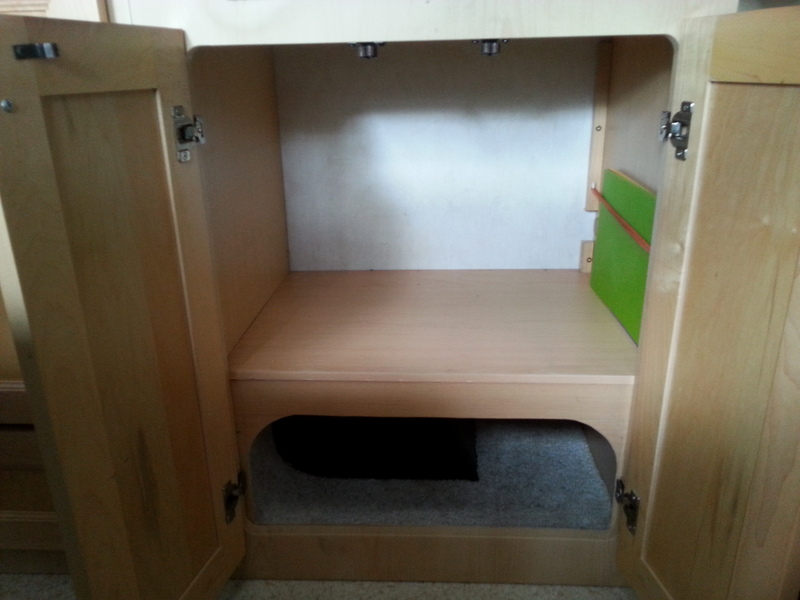 We have fiberglass instead of wood, but you have inspired me to start thinking about creating access to some of our hidden storage, especially under the rear bench sections. We don’t have any storage under a bench as many trailers or Casitas. That’s where our propane heater and water heater on the other. Under the bed is storage accessed from outside. We were delighted to find a new little cubbyhole. Easy to cut thru a small plywood piece….fiberglass?…not so sure. I cut a hole in my fiberglass roof for the fan, remember? So I’m not afraid to tackle the bench. I did forget. You are my fearless hero. Alison, if you were ever to see our garage, you wouldn’t ask for John’s help. But, we do hang up all our bikes, which helps. We’ll have to see if carpet scraps work or not. Small pieces, easy to replace. Lots of scraps around. I’m pretty sure there are laws against that! TADA! Your idea worked and worked fabulously. Ours is in storage now but I can see this is a must-do modification. Hurrah! P.S. Can you find more? !